This step by step tutorial explains how to draw some of the more popular anime and manga facial expressions. 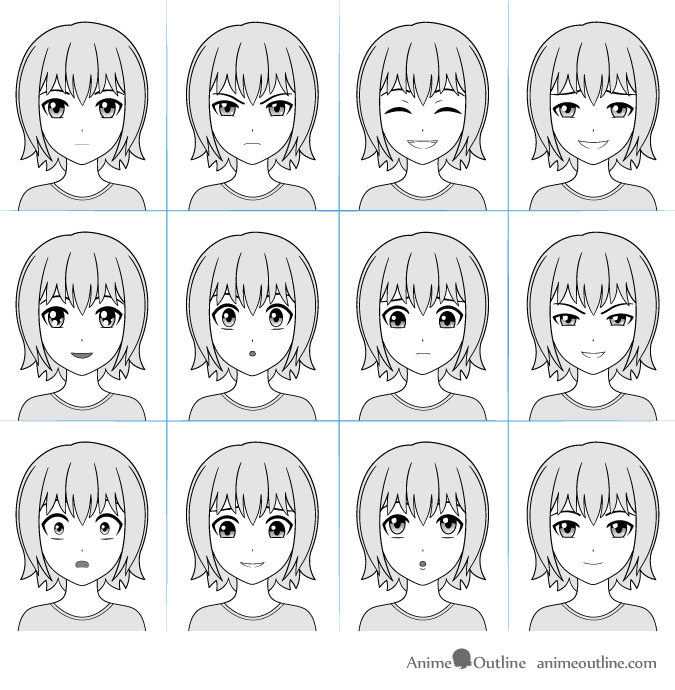 16 Examples of How to Draw Chibi Anime Facial Expressions. Wen drawing the head in the front view first draw a vertical line (this will be the middle of the head). This line will help you get even proportions on both sides of the head. Next draw the overall shape of the head. 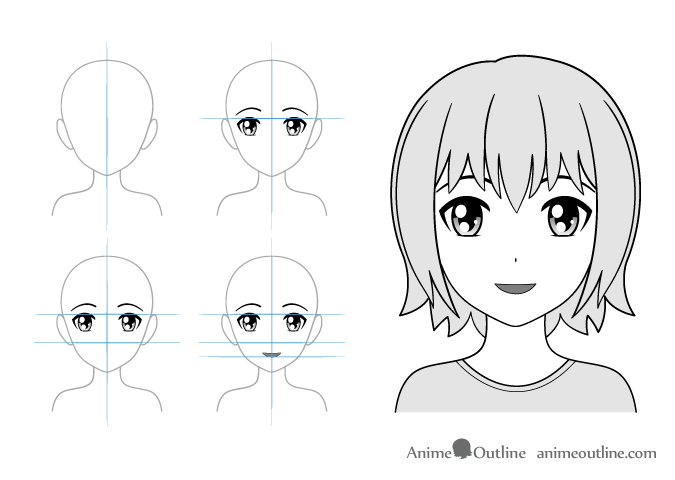 The facial feature can shift slightly over these lines with changes in facial expression. The positioning can also vary due to style but these are good guides to start with. Draw a horizontal line though the middle of the head and draw the eyes below that. 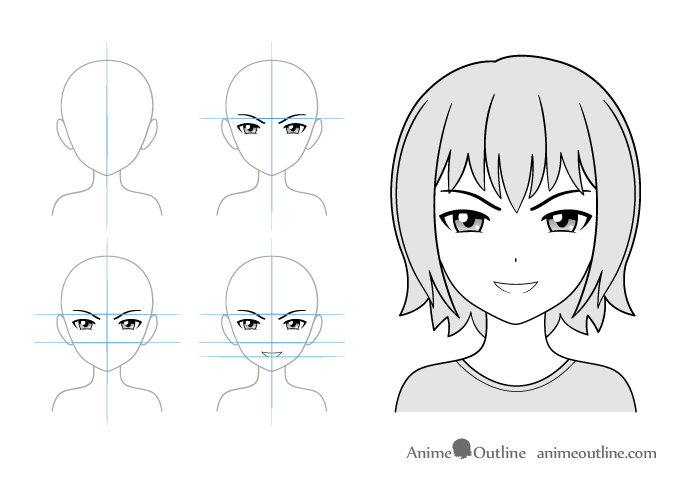 Draw a horizontal line between the middle horizontal line and the bottom of the face. This will be the position of the nose. Draw a line between the nose line and the bottom of the face. Draw the mouth slightly above that. The reason for this is that the line will actually determine the position of the bottom lip. For an angry face draw the eyes squinted, the eyebrows down and closer together and the mouth in an upside down arch. 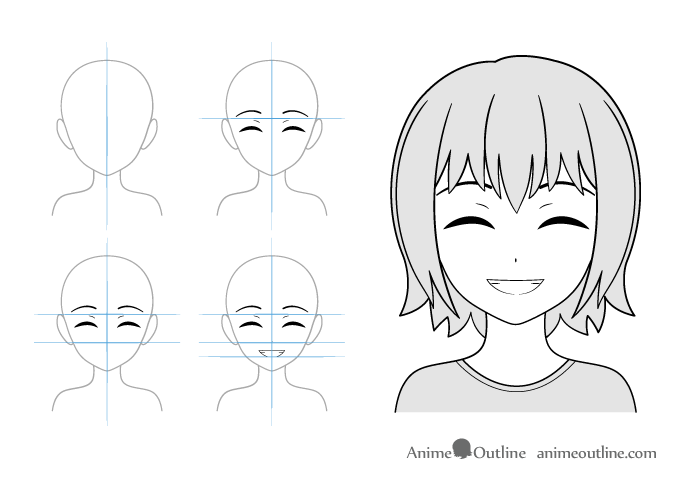 For a content and happy face you can draw the eyes completely closed (basically you just draw the eyelashes with a hint of the eyelids) in an arch. For the mouth just draw a hint of the teeth. For a gloating expression draw the eyes squinted and the eyebrows in upside down arcs. For an in love appearance the eyes are the most important aspect. 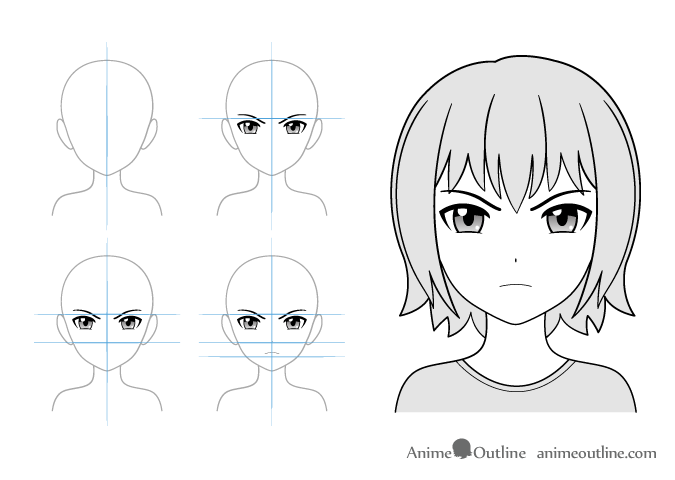 Draw the pupils bigger than normal and add more reflections to the eyes. For a confused facial expression draw the mouth open in an “O” shape. Draw the eyes wide open as well with the eyebrows lifted. You may also need to draw the irises (and everything contained in them) small than normal. Finally you can draw the irises slightly closer together than normal as well. For an upset face draw the eyes looking. 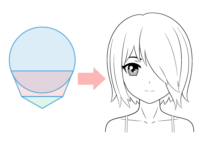 Draw the mouth in a slight upside down arc. Draw the eyebrows as slopes raised towards the middle of the face. You can also see 4 Ways to Draw Crying Anime Eyes for drawing really upset characters. For a look like the character you are drawing is plotting something draw the eyes squinted and the eyebrows down. 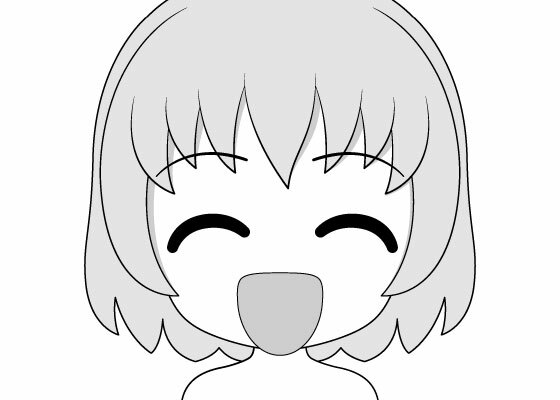 Draw the mouth with a light smile. For a scared expression draw the eyes wide open with the eyebrows raised. Draw the mouth slightly open and draw the irises/pupils far smaller than normal. You can also draw the irises slightly closer together than normal. For an embarrassed look draw the eyebrows in a slight upside down arc and raw the eyes looking down. Draw the mouth with a light smile. For a puzzled expression draw the eyebrows and the eyes raised, draw the mouth slightly open with an “O” shape. For a light smile draw the mouth in a light arc slightly wider than a normal mouth. Draw the eyes slightly squinted.